This Wednesday, November 15, Kevin Jiang will welcome Coleman Hughes on the Musician's Show (6:00-9:00 PM EST). Hughes found a passion for music at a young age, starting to play the violin, the piano, and the drums at ages 3, 5, and 8, respectively. 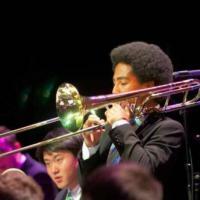 By middle school, he settled on the trombone as a primary instrument, and went on to participate in elite high school all-star bands like the Grammy Jazz Ensemble and the Next Generation Jazz Orchestra. Along the way he played and/ or recorded with the Michael Dease big band, the Christian McBride big band, the Mingus big band and many others. More recently, he has blended his love of hip hop with his experience in jazz, and now raps and plays trombone with a live band under the name Coldman.